LOWER RATES WHEN BOOK DIRECT. 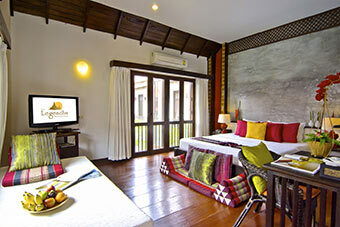 Located just next Sukhothai Historical Park and 45 mins to Si Satchanalai Historical Park. Legendha Sukhothai resort is spectacularly designed and landscaped in Thai village concept to deliver a sense of Thailand’s authentic ambience whereas Chedi Wat Chang Lom - ancient temple in oldest capital of Thailand - lies at the back of our boutique hotel providing the intimate touch of historical landmark up-close. 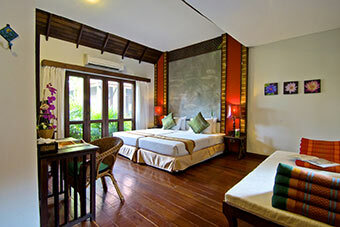 All guestrooms featuring teakwood furniture and generous ensuite amenities are meant to maximize you to utmost comfort. Swimming pool with jacuzzi heads and children pool is specially available in salted condition. Our outdoor Namkhang Sukhothai restaurant offers one of the best restaurants in Sukhothai. Our hotel guests can enjoy local experiences such as almgiving in the morning, buddhist votive amulet making, Sukhothai styled costume dressing, making fresh flower garland, Thai cooking class and FREE Thai classical dance show i nthe evening. Within minutes from our hotel, there is a must-visit - Sukhothai Historical Park declared the World Heritage sites by UNESCO to visit popular ancient sites - Wat Mahathat,Wat Si Chum,Wat Sri Sawai,Chedi Wat Chang Lom,King Ram Khamhaeng Monument,Wat Saphan Hin. Another is 'Si Satchanalai Historical-Park' located just 50+ mins from our Sukhothai hotel in Old city. This Sukhothai heritage and treasure is appealing to worldwide tourists and can be visited all year round. The temples stone inscription in the 15th century found at this temple describes the story of "Phanom Saikham" who entered monkhood and indicates establishment of Buddha images, construction of the scripture hall, planting of Phra Si Maha Bodhi tree (the holy auspicious bodhi tree) and building of Buddhism structures. The main monument (chedi) is surrounded by the gallery ("Rabieng Kot") which served as a walkway for performing ritual clockwise circumambulation. This World Heritage Site was the original capital of the first Siamese kingdom. Surrounded by two moats and bridged by four gateways, the old walls contain the partially restored remains of 21 historical sites, including royal palaces and Buddhist temples. At night, Legendha Sukhothai resort offers you authentic Thai cultural dance in an open-air theatre next to our NamKhang restaurant. Thai traditional dancing (Thai: รำไทย Ram thai) is the main dramatic art form of Thailand in gorgeous Thai costumes that always catch audience’s attention. Authentic Thai Restaurant with long reputation in real Thai gourmet for decades. Experiencing a fine dining amidst the old town of Thailand, only minutes from UNESCO World Heritage Site Thailand. 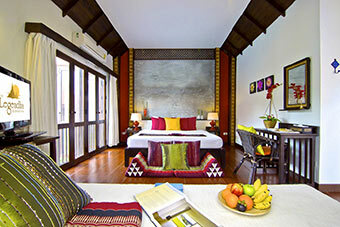 Decorated in contemporary Thai Village-style atmosphere with a taste of Thai culture. The Loy Krathong Festival is one of the most picturesque festivals in Thailand. It was originated here in the first capital of Thailand, and now it is a nationwide festival. The festival is held on the 12th full moon of the year, which usually falls in November. This year it will be celebrated in mid November. At the end of the rainy season, the full-moon will light up the sky and thousands of lighted candles will be carried, located in houses and temples, flying in the sky and floating on the rivers to ensure truly magical scenes. - Located in Sukhothai Old Town, 1 km close to Sukhothai Historical Park, World Heritage site by UNESCO. - We spend our daily life with responsible tourism in mind. We believe it is the core to achieve the sustainability. We value our communities and environment not only vision, but action. We spent one night in this hotel during an organized tour of the northern part of Thailand. The hotel is fantastic, the rooms are amazing, big, with comfortable beds and a nice bathroom, everything is Thai vintage style, with a lot of wood furniture. We had a room in front of the pool...amazing! We were able to jump out of the window and be right in front of the swimming pool. I can only use one word for this hotel : Perfect. The hotel is has a very good location for visiting the historical park. We used the bikes from the hotel and although the age of the bikes it was a pretty way to do the visit. The staff is extremely friendly and do everything to help you on all your questions. We can also advise to use the spa, they have really professional people working there. We were accommodated here for a couple of nights, last november, during a tour throughout Thailand. The hotel proved to be an oasis in Sukhothai town, close to the historical park (we walked all the way to the park, but is better to get a tuk-tuk ride or hire a bike). 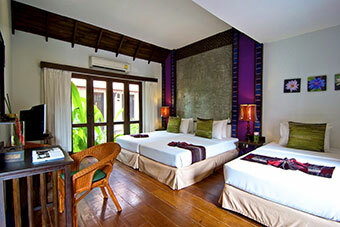 The resort was very clean and well maintained, The staff was professional, friendly and provided prompt service. We enjoyed our stay thoroughly and highly recommend this place to anyone looking for a place to stay in Sukhothai. 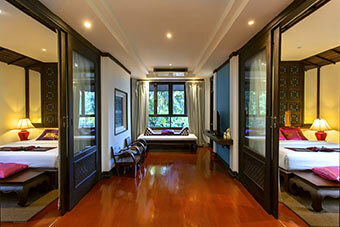 If you are in Sukhothai for visiting the historical park, this very nice hotel is perfectly located, few minutes away. The description is accurate and the atmosphere is very serene. We stayed at the hotel for two nights and enjoyed every second of it. Great friendly personnel, nice rooms, and the restaurant was fine (I liked the a la carte dinner better than the buffet) We did not have an upgrade but the room was really good, and really close to the little safe haven of wat chang lom. We book this hotel because of the pool. What a great surprise we got. As we walked into the hotel you see the AMAZING gardens and river that they have, absolutely gorgeous. It seems you are in paradise, only issue mosquitos, so be aware. It was super quiet to sleep. We stayed for one night only. Wonderful staff and facilities. Quiet, cool rooms and free WiFi. Pool excellent. Restaurant good with Thai dancing at dinner. The grounds were like botanical gardens and extensive. You can pay a small amount to experience offering food to monks in the early morning. A great experience.